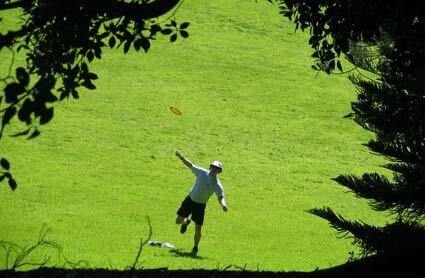 New Zealand's largest city has hosted quite a few disc golf tournaments in its day - the Freaky Styley Crater Cup being the one that attracts a lot of players from around the World. And it was in Auckland 30 years ago (yes, thrity years!) 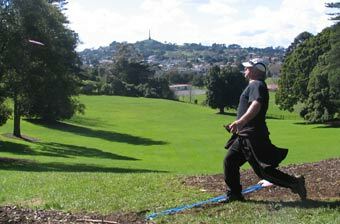 that the first round of disc golf was played at Auckland's One Tree Hill. Yet this city has never had its own Championships. Until 2006. 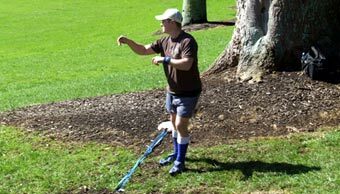 It was an idea that Mr Disc Golf NZ himself was toying with, but was thinking about starting off in 2007. But young Dave Keene - one of Auckland's new and extremely keen (pardon the pun) convinced Bob to start the Auckland Champs off in 2006 during a period in the New Zealand tour where there was a gap in tournaments. 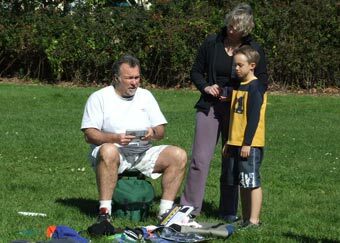 "I'll help out," offered the skinny soccer player who has quickly moved into the ranks of Top Group contention, "I'll organise all the baskets, arrange with the owners to get them here - you relax Bob." 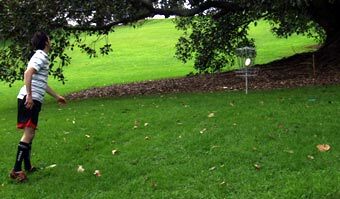 And so it was with short notice that players throughout the country (and World as it turned out) learnt that the very first Auckland Disc Golf Championships were to be held late in winter at the awesome Monte Cecilia Park. One appealing factor (amoungst many) was that this would be a chance to play on the course for the 2006 Match Play Championships in December. Perhaps it was this that attracted a fine contingent of players - 22 in fact - or perhaps that they had heard that stylist band Oh Three Four were to perform for the combatants on the Saturday night. Either way, organisers were most pleased at the turn out. And the players were most pleased at the weather that greeted them for the weekend. Warm sunshine fell on the course for most of the tournament - we even saw Ari Verderci with his shirt off (one ugly side to summer!- Ed). An Albatros is Feasey-able! - Players watch in awe as Simon Feasey (Western Springs) goes oh so close to aceing the par 4 7th. Wow! 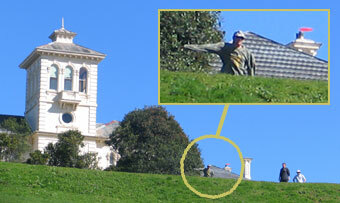 What Simon Can Do, I Can... - After watching The Fease fire over 160m, Marty de Haas (One Tree Hill) tries to out-do him. Unfortunately he's a leftie, so he was off to a bad start. Nice style at the tee tho' and that's what counts for the Matamata born Freakster. Much was expected of the locals as it was well known that some players had been practicing on this course more than 3 times a week! So eyes were on the likes of Bob, Waiheke Hailstone, Baz, Marty de Dev Haas and Skinny Keene. But there were other players to watch out for more than happy to take the Auckland Trophy. There was a rumour we might see current New Zealand Match Play Champion Steve Scarborough for the first time since his great win in 2005 (see story here) - and sure enough he supported the local scene by turning up Saturday morning ready to play for he glory. And, as often has been the case lately, there was the token overseas visitor - this time we welcomed Missourian Ryan Schulze, a seasoned disc golfer on his way to a permanent work position in Timaru. Watch out for the frisbee scene getting hot in the second largest fishing port in New Zealand. Ryan was hosted at the home of tournament director Bob Gentil, always accomodating to international disc golfers in the knowledge that frisbee friends make great guests. Rooting For The States - American golfer Ryan Schulze had just arrived in New Zealand on his way to residence in Timaru and stayed to play the Auckland Champs. 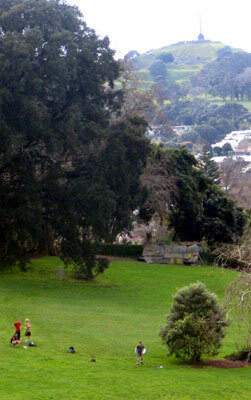 Watch out for disc golf happening in sunny Timaru! Here Ryan hoiks one down on the 4th. Actually he did a lot of hoiking...yuk! And then there were the regulars that seem to be ever improving - like Brett Hailstone, promising so much after his dazzling Crater Cup 2006 form. Not to mention the man himself multi-national champ and Aucklander Simon Feasey who had to be favourite should he manage to get through 3 rounds of a non-tour event with many other commitments at hand. 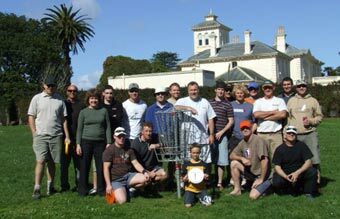 So, the inaugural Auckland Disc Golf Championships of 2006 were looking to be quite an exciting affair. And it didn't fail us. Fashion Statement - David 'Skinny' Keene is promising so much as such a relative newcomer to this sport. Here he makes a fine birdie on 8 on the way to a dazzling 5 under 53 final round to ensure outright 4th..
Gosh Josh! 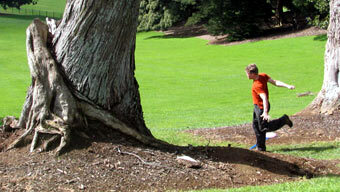 - Auckland golfers were pleased to see the man with The Forearm throw, Josh Smith (Hamilton) at the Auckland Champs. Matching Skinny's sock fashion, these boys fought it out round after round. All that was missing were the shinpads. As we all well know, weather conditions can highly influence the enjoyment of a disc golf event. And in became evident that all were going to be pleased as the threat of late winter weather offered little more than a wee shower. In fact, sun shone upon the golfers more times than not - a sometimes scary thought when Jim decides its time his torso got some sun and removes the shirt. Baz is pushing for a rule against that sort of thing after being blinded by Jim's belly on the 8th. The three round format meant there was to be no bedding in - if you were going to fight for the title, you had to come out throwing. Accurate that is. 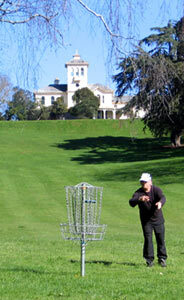 5 groups of keen golfers returned after 18 holes mostly happy to have got to play on such a great park with baskets. And some were happy for other reasons. Like TD Bob Gentil who clocked an awesome seven under 51 to be joint leader with favourite Simon Feasey. 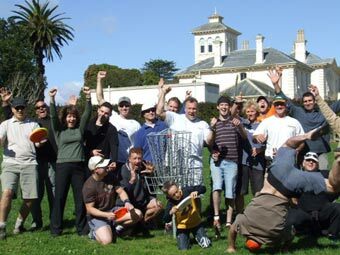 Our intrepid discgolf.co.nz reporter Iva Storeree had been keeping tabs on those practice rounds the locals have been having and word was that the GM was not winning every round in his usual fashion. So we were pleased to see the jovial DJ play well. The bookies were to be busy. 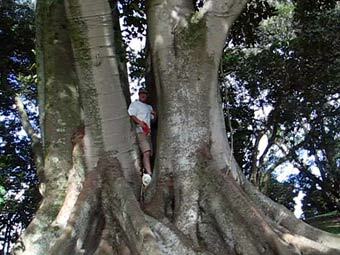 At One With Nature - Richard 'The Harp' Allen (Tauranga) was in a wee bit of a pickle on 15, but managed a great recovery from within the Morton Bay Fig to save par. 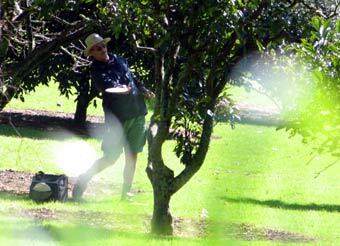 Hiding in the Bushes - (Taumarunui)was 'grapefruitful' to have a clear shot up to the basket on the toughest hole of the course, the 14th. Thanks to his accurate forehand method that is. Feasey was, as usual, going to be very hard to beat - especially in his home territory. But rumour was that the short notice of this championship may prove to work against him with some prior plans threatening his inclusion for Sunday - one of them being the birthday of his lovely wife Yvette. Happy Birthday Yvette! So leading into the afternoon, Bob could look to any of six players under par for where the threats might come. The American Ryan scored a fine 4 under, Waiheke Hailstone was holding together well with a 3 under and madman Marty de Haas - he of Ace fame - on 2 under. So we were indeed seeing that this 'practising' was working for some locals. 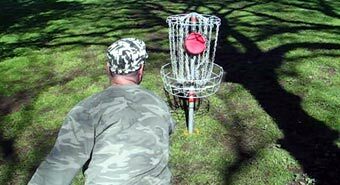 But enter the mind game - as the great Someone A Rather said, disc golf is 5 percent plastic, 95 percent mental. And by the end of the day, Simon Feasey surprised no one by leading with another wicked round of 52. The best thing about the style of this Kiwi great is the leisurely way he approaches the game, always encouraging others and, like most of us, representing the game in the manner we all should. After all, its just a game! Try telling that to those fighting for fame or shame in all the various categories. The battles were fierce at all levels. With an evening to think things over, Bob was sitting in outright second, wondering if Simon would show up on Sunday. Oh well, time to work out strategies later - there was a party at Lindis and Bob wanted to be there to see legend golfers-come-muzos Oh Three Four with special guests No Show Pete on drums and the awesome harmonica hamster Rich 'Wonder' Allen. Straight Arm, Straight Fellow - Pete Anderson (Blenheim) was playing some great golf over the tournament. Here he lets fly a deadly straight drive on Monte Cecilia's signature hole, the 'Full Monte' 10th watched by golfing and riding buddies Baz 'The Voice' Keene (Hillsborough) and Dave 'Serf' Hartley (Mt Eden). Here's Lookin' At Ya, Maungakiekie - Paul Cohen (Waiheke Island) throws a controlled drive on the 4th with a backdrop of Auckland's other famous disc golf venue, One Tree Hill. At Last - Hole 10 was a tough one for Paul Cohen (Waiheke Island) on Sunday. A wayward few approach shots after an enormously long (winded) drive, meant this fine putt was only for a double bogie. Gapping It - As the sun broke through to make the experience even better, long time leftie and proud of it Dave 'Serf' Hartley fires in an approach on the 7th, looking to practise for his next attempt at the all famous Freaky Styley DAKAR trophy. After a great night at FS Central,it was back to the park for the third and final round. Sure enough, Simon had done the right thing and stayed away. So Bobs game took the approach of just keeping a step ahead of the other contenders - in this case Steve Scarborough, Marty 'de Dev' de Haas and Ryan Schulze. Whilst Steve got within a whisker at one stage, he was unable to reel in the Master and even got pipped by de Haas for second place with Ryan fading, having trouble contending with the fact that the kiwis still regard being up a tree as a hazard worthy of dropping a shot. Such language! A couple of great rounds from 2 players that we just know we will see holding up a trophy or two in the future, Dave Keene and Brett Hailstone, saw them jump past the American by one shot. It could be said that womens disc golf in New Zealand suffers from lack of partcipation, but we can usually count on Disc Diva Ming Menzies to make a tournament and we have certainly seen a very noticable improvement in her overall game for 2006 and this weekend she was matching it with the boys from the same tees, shooting an awesome 64 on the last day. Well done Ming! So it was a fitting start to the realm of the Auckland Disc Golf Champs with the man who has been leading the way in kiwi disc golf for nigh on thrity years, Bob Gentil. Amazing stuff. Congrats to Bob and a big thumbs up from the disc golfing community for sussing out such an ideal park for disc golf, Monte Cecilia and putting on a great event. Yet again. was on fire with the putter on Sunday - this great shot on the 15th was his third long putt in almost as many holes for birdie. The secret of the 11th eh Paul? Gentil As She Goes - The pressure of tournament directing did not slow the Grand Master himself Bob Gentil firing to a great win. Here he is flanked by Team G - Sheree and Junior Champ Toby..
That'll Do- Camouflaged against recognition from some of the gals in his life, On The Beat Pete of Oh Three Four fame bangs one right in the middle. Of the chains. Monte Memories - The sun shone on these intrepid heroes as they prepared to bid each other farewell until next time. 8 Brett Hailstone Waiheke Isl. 14 Nigel Barnwell Waiheke Isl. 15 Paul Cohen Waiheke Isl. 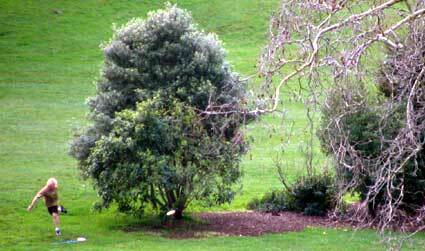 2 Juan Unda Mangere Mtn. 16 Siep Van Vliet Waiheke Isl.